I have been thinking over the last few days about how many students I have had over the course of my career in teaching martial arts. The number is pretty big due to all of these years working with the KICKSTART KIDS Foundation. Over 1100 students have passed through my doors from KICKSTART KIDS classes alone, and I hope all of them carried something away with them that they didn’t have when I met them. The point of this article is what separates those of us who are martial artists for life form those who are here for a while and then gone, never to be heard from again? I have put together a list of what I feel are the contributing factors to people who quit training in the martial arts. I must point out first, this is nothing more than my opinion…here is my list, in no particular order. 1. Personality clashes. When asked why I have trained in my style for so long, I tend to give the answer that I think the questioner wants to hear (because in my heart I don’t think anyone really cares why I have trained in my art for so long, they are really just making polite conversation). I have given answers along the lines of the effectiveness of the system, temperament, physical fitness in relation to the overall strategy of the system, etc. But the simple fact of why I got so deeply immersed in Hung Gar is not so complicated, or all particularly well thought out for that matter. I stayed because I liked my instructor and think the training is fun. Plain and simple. We got along quite well. He was often short tempered, but not with me. We had a similar work ethic, we enjoyed hard contact in training, and we never felt that either of us had completed the journey and knew all we needed to know. He was fun to be around, had a ton of knowledge, and never grew tired of teaching. With many students, a big factor in their quitting must be a lack of that kind of personal rapport with the instructor. There are instructors who are teaching for the money and not for the joy of sharing the martial arts journey with another like minded person. There are students who begin training for the wrong reasons. There are also people that we just don’t like, for whatever reason. This is a two way street. There may be students that the instructor just doesn’t like, and he or she may then put less effort into that student’s training. But as often there are students who simply do not like the instructor. These students will undoubtedly quit, and there is little to nothing that can be done by the instructor to prevent it. 2. Unrealistic goals. I cannot count how many times I have had students show up with amazing energy and outrageous expectations in the beginning, only to end up quitting before they ever really got started. Many students come in with the idea that they are going to become Bruce Lee or Chuck Norris in the very cliché “Ten easy lessons”. The real world doesn’t work that way. I have said many times, but it does need to be repeated – the only secret in the martial arts is that success comes only through hard training and sacrifice. Period, end of discussion. Black Belt level skills are a product of years. Not weeks, not months – years. There are no shortcuts. And, as any Black Belt who has ever let their training slip can affirm, the skills of that level require constant practice. There is no end point. Proper expectations for martial arts training in any system would be to commit yourself to years of rigorous training, and never stop. Again, there is no end point. There is no time when you will be able to truthfully say, “I’m there! I’ve arrived!” Skill in the martial arts is a process. 3. Boredom. There is no easy fix for this one. To one who has a passion for the martial arts, the training never is really boring, but it can get monotonous. Unfortunately, there is no real way around it. I remember reading a line from Gichin Funakoshi, wherein he stated that he had been studying a reverse punch for over forty years and was only now beginning to understand it. This is a little excessive on first glance, but I think something must have been lost in the translation. You can really learn all you need to know about the actual mechanics of delivering a reverse punch in less than an hour. But to reach that point where you can deliver it from different distances, different angles, and less than ideal circumstances is going to take a lot more practice. And if you do learn the reverse punch in less than an hour and never return to practice, you won’t really understand what is involved in all of this. It is frustrating at times, as an instructor, to have students tell me, “But we did that last week”. You have to repeat and repeat and repeat to make even modest gains in skill. To any martial arts student reading this, please take this to heart! Some of the repetition will never go away, deal with it. 4. Priorities. My students laugh at me when I bring this up, but I bring it up anyway as it serves to illustrate a very important point. I went out on my first date when I was 20 or 21 years old (I don’t really remember which…). M teen years were filled to the brim. School, work, and kung fu. I simply didn’t have time for “extracurricular activities”. There were (and still are amazingly enough) only so many hours in a day. I really didn’t have time for dating. Many of the students who quit training simply do not have martial arts as a priority in their life. There is nothing wrong with that, but don’t whine and cry about how much time training takes up. This is part of what old timers are speaking of when we use the term “sacrifices”. We lost time with friends and family on our journey, and we did it because we had a single minded determination, and we were not going to be swayed form the goal. There are few students left who have this kind of determination. I don’t say this to insult the modern students. There are some who are quite determined, even up to the levels of determination I am speaking of here. But “some” does not equal “a lot”. And when you factor in a simple fact, everything changes. You will always have time for whatever you want to have time for. 5. Life gets in the way. I cannot leave the previous point without addressing this one. This one is huge because I cannot argue with it. When someone is training in the martial arts, and they find out a baby is on the way, or they get a job promotion which is going to require more hours, and so on. These are the types of life events that can get in the way of training. I have had students who had to quit training with me because they were working full time, and going to College full time. It would be very out of line to try to argue against this. I have friends who were training but ended up in a life situation where they could either train or buy diapers for their kid, and again, if one were to argue against this, it would be monumentally stupid. 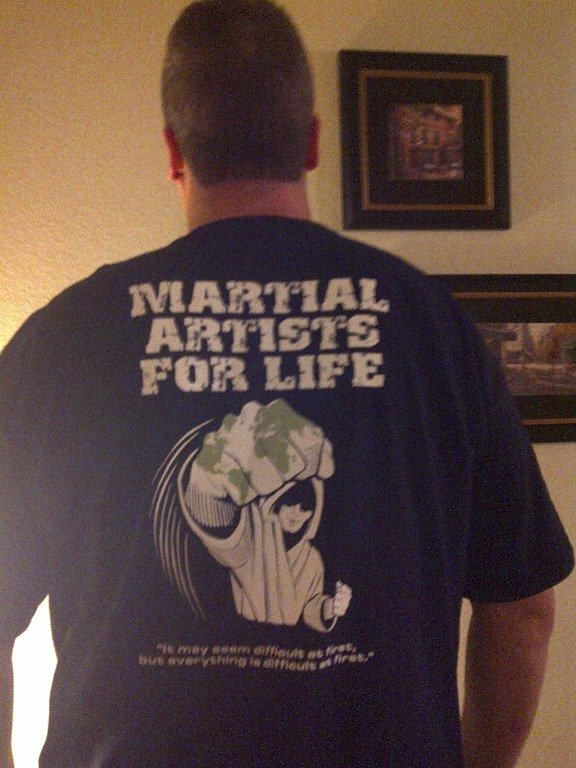 The simple fact here is that there is more to life than martial arts for many people. Life can get in the way of your goals. Some things can be avoided or overcome, and others cannot. My kids are my top priority in life, everything else, and I mean everything else takes a back seat to my time and energy for my kids. I do understand this one. I am lucky that life never got in my way, but everyone has their own set of circumstances, and we must all handle what comes our way in our own way. There is my list of things that I have seen as what makes people quit training. As stated everyone has their own life to deal with. Next up, a look at the people who are “lifers”, and how they handled some of the obstacles listed above. Next Post What can kung fu learn from MMA?